The martial arts classes for kids at Stealth BJJ are a great way for your children to build confidence, focus, discipline and fitness. Through the activity of martial arts they will meet new friends, learn an effective self-defence and most importantly have fun!! Brazilian Jiu Jitsu (BJJ) was made famous by the Gracie family in the 1990’s. They demonstrated the effectiveness of Gracie Jiu Jitsu in mixed martial arts and self-defence and how it is not necessary to punch and kick to defend yourself. Taekwondo and Karate focus on striking, whilst Jiu Jitsu is a grappling/wrestling based discipline, which looks at controlling an aggressor without having to hit. 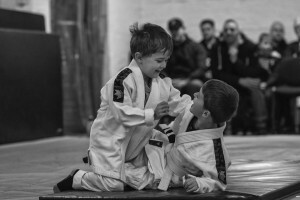 Stealth BJJ’s kids classes have been developing over a number of years now. Our structured martial arts syllabus is fully in place now for the kids and we are seeing great results! Our kids activities are all about increasing confidence in your child. Unfortunately, in today’s society bullying is becoming more common, especially amongst children. We believe that by building confidence in the kids it helps prevent children from being bullied or even becoming bullies. If you are looking for an alternative sport for your children, why not give our Brazilian Jiu Jitsu classes a try. 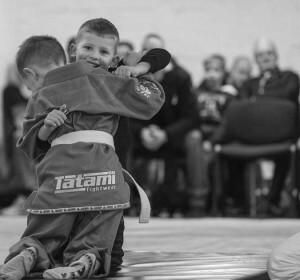 We split our children’s BJJ classes into 3 age groups so that they can get the most out of the martial arts lessons. This is a fun martial arts class with lots of games, focusing on balance and movement. It’s a great way to build confidence on the mat and give your child a good foundation to work from. This class contains lots of Brazilian Jiu Jitsu based activities and games. The focus is still on fun sporting activities and developing core movement skills, but slowly introducing fundamental techniques of Jiu Jitsu. This class contains lots of the fundamental techniques that are seen in the adult martial arts classes. Everything is adapted to the kids though, presenting it in a fun, fast paced, game based class. The focus is on the kids enjoying themselves, but learning key skills and building confidence along the way. If you still aren’t sure, just give us a call or text on 07903644928, drop us an email, or join us on Facebook and we’ll answer any further questions – hope to see you soon! For more information about the Kids Brazilian Jiu Jitsu classes contact us or feel free to turn up to one of the classes.